IP treatment for dry eyes is the latest, pain-free and effective way to treat dry eye related to Meibomian Gland Dysfunction or MGD. Approximately 50% of dry eye is caused by MGD. IPL treatment has been shown to improve tear quality and improve patient-reported symptoms. There are many common treatments for dry eye – such as artificial tears, hot compresses, and eyelid wipes. The treatments generally help to relieve symptoms rather than treating the cause of the condition. IPL treatment for dry eyes actually treats Meibomian Gland Dysfunction (MGD) – the root cause of evaporative dry eye. Treating MGD will not only relieve symptoms, but it will also to slow the progression of chronic dry eye. If you’ve had limited relief with drops, warm compresses of lid wipes, then IPL treatment with Dr Dave may be a better solution for you. See IPL FAQs here. The meibomian glands in the eyelids produce oil that forms part of the tear film. The oily layer prevents the tears from evaporating. MGD occurs when the meibomian glands are obstructed or inflamed. Patients with facial or ocular rosacea, have abnormally dilated blood vessels (telangiectasia) along the eyelid margins. These dilated vessels deliver increased inflammation to the eyelid and can cause dysfunction of the meibomian glands. 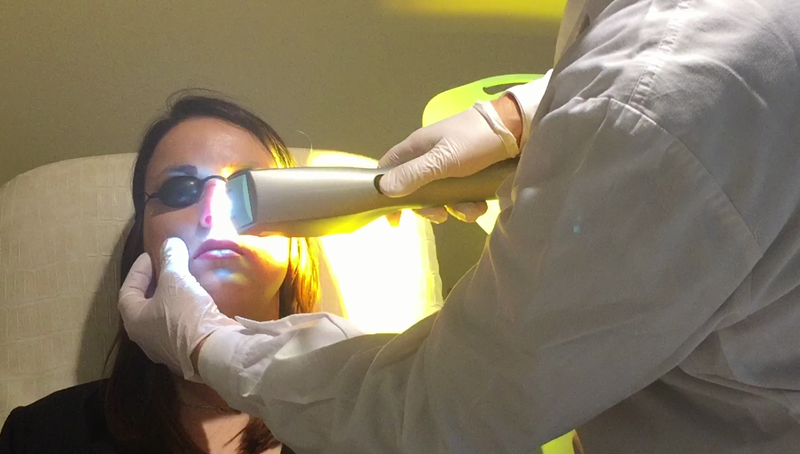 IPL causes photocoagulation (it closes these abnormal vessels) and also photorejuvenation of the skin cells. IPL treatment also opens up the meibomian glands and liquifies of the oil within the glands. After the IPL treatment, Dr Dave will manually express the meibomian glands to release the old oils in the lids. Don’t have IPL treatment for dry eyes if you’ve used tanning beds 3-4 weeks before to treatment. No harsh cleansers/scrubs on your face for the next two weeks. Warm compresses using EyeBag to eyes for 10 min 2-3x per day for the next 3 days and then every night. EyeBags available for purchase in our practice. Most patients notice an improvement only a few hours after the first treatment. However, depending on the severity of the condition, up to four treatments may be required separated by 2-3 weeks. After the third or fourth treatment, further treatments will not be required for up to a year. Generally, patients require one top-up treatment annually. The cost for IPL treatment is available here. this is only for patients who have decided to have treatment and had a face-to-face consultation with our staff.